Carolina Herrera is launching two new limited editions of the 212 line for 2016. 212 VIP Wild Party and 212 VIP Men Wild Party are following the original 212 VIP from 2010, 212 VIP Men from 2011 and 212 VIP Rose from 2014, as well as the last year's limited editions named 212 VIP Club Edition. The new fragrant pair is announced a homage to the dancing and nightlife of New York City. 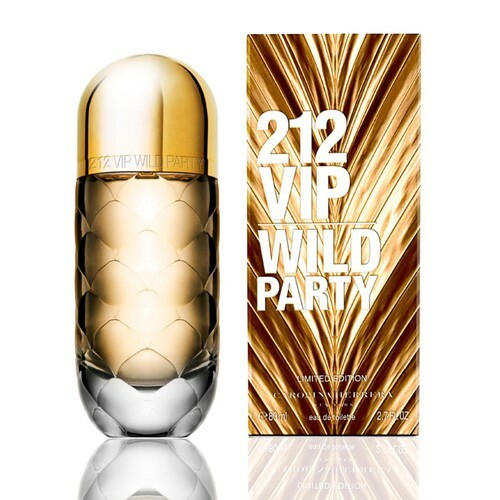 212 VIP Wild Party is announced as a fresh, floral-fruity, golden cocktail of exotic ingredients. The woman who inspires this fragrance is urban, charming, impulsive and expressive. The composition begins with luminous tones of grapefruit and pineapple, followed by a heady explosion of orange blossom, sun rose and orchid in the heart. Sensual woody and musky undertones round out the base.